Why you looking at me that way, BOWton? This is probably the most controversial book and the most honest book ever written about baseball. It is interesting how the words honest and controversial seem to travel together like a Harley Davidson with a sidecar. 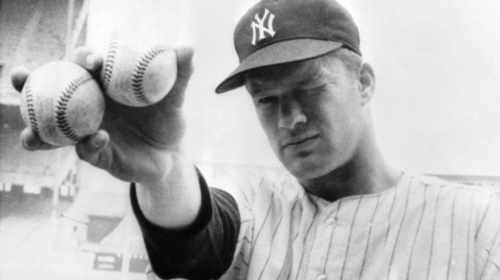 Jim Bouton won two World Series games in 1964 with the New York Yankees, but in 1965 he developed arm troubles that turned the pitching phenom from a starter into a bullpen pitcher. When we catch up with Jim, he is with the Seattle Pilots expansion team, trying to learn how to throw a knuckleball in an attempt to resurrect and lengthen his career. Now if you haven’t heard of the Seattle Pilots, don’t feel bad because I’d never heard of them either. They only existed for one year, 1969, and then they were moved to Milwaukee to become the Brewers. My question is who told Pete Rose about Shakespeare? The controversy was over Bouton revealing the everyday stupidity that sometimes colossally bored baseball players got up to. Not to mention the rampant alcohol and drug abuse, greenie anyone? Greenies were speed, and pretty much everyone on the team was using them, at least in their minds, to ramp up their abilities on the diamond. Wrapped around all this was the serial infidelity that was just considered one of the perks of being a professional ball player. One of the coaches of the Pilots would always remind the guys before letting them off the plane to go meet up with their wives…”Act Horny”. 1964 after a World Series win. 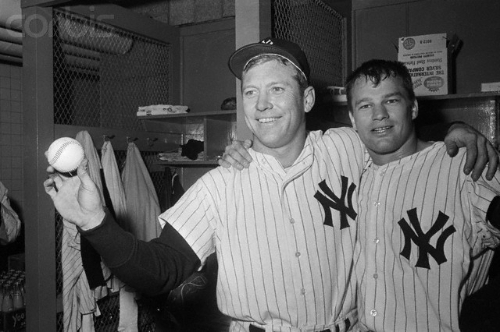 Mantle and Bouton were still friends. Now all of that was bad enough, but where Bouton stepped over the line for many baseball fans was revealing the less than stellar lifestyle of the legendary Mickey Mantle. Sportswriters have a long history of protecting athletes. Most recently, though it was common knowledge among reporters, nothing was reported on the infidelities of Tiger Woods. His image, as far as the public was concerned, was that of a brilliant athlete with the perfect wife, the perfect life. The press was well aware of Mantle’s excessive epic drinking and his infidelities, but never wrote a word about it. 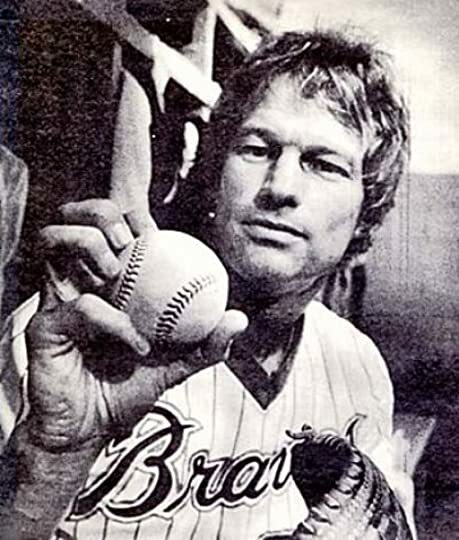 Then comes along Jim Bouton. 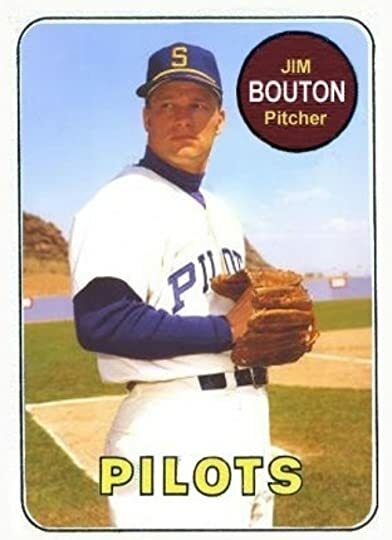 Bouton is a rookie on the Yankees, and one of the first stories he tells about Mantle is the whole team gathering around him on the rooftop of their hotel that, by the way it is angled, gives them a bird’s eye view into hotel rooms across the way. They could watch women undress. I’m not sure, since this was a group effort, that we can even really call this Peeping Tom or Toms. The guys called it ”Beaver Shooting,” and they put a good bit of effort into finding ways to see women exposed. One player drilled holes into the connecting door of his hotel room so he could spy on whoever was in the next room. In another case a player drilled a hole through the back of the dugout wall so he could peek up the skirt of an unsuspecting fan. They had mirrors that they would slide under hotel room doors. The list goes on and on. It was almost a pathological obsession. It reminded me of one time when I was about fourteen, and I was hanging out at the bottom of a set of stairs at the high school waiting for a friend when several girls started down the steps. I looked up to see if it was my friend coming, and my line of sight gave me a perfect uninhibited view of the girls’ underwear. I was gobsmacked. I was turned to stone. I forced my eyes away after what felt like fifteen minutes, but was only probably a fraction over a second. I was sure they knew! They were of course oblivious, but it didn’t keep me from turning thirteen shades of red as their mingled perfumes brushed by me. Now certainly, Bouton created more stress for himself because it wasn’t long before everyone in the clubhouse knew he was writing a book. He had a sneaking suspicion that the head office might not be all that happy to know he was keeping track of their activities, and the ball clubs antics, and the decisions that were being made behind the scenes. He had the normal ball players paranoia times ten. You, too, can learn how to throw a knuckleball. I have to admit it was fun coming home from work each day and spending some time with the Seattle Pilots. They might have been all too human, but they were certainly real. I have to hope that this book also had some positive impacts on professional baseball. I hope that clubs took a look at the drug use and the after hours carousing. I have a feeling a few wives had a few questions for their baseball playing husbands. Maybe even some ball players seeing themselves in this light, exposed (that would only be fair), made some changes to how they conducted themselves. This wasn’t the era of exorbitant salaries, but they were certainly making more than the average American who came to see them play. Whether they wanted to be or not, they were/are role models not only for kids, but for fans of all ages. Now, I have to go back to work. Anyone got a greenie?